Toss: GE won the toss and elected to field. 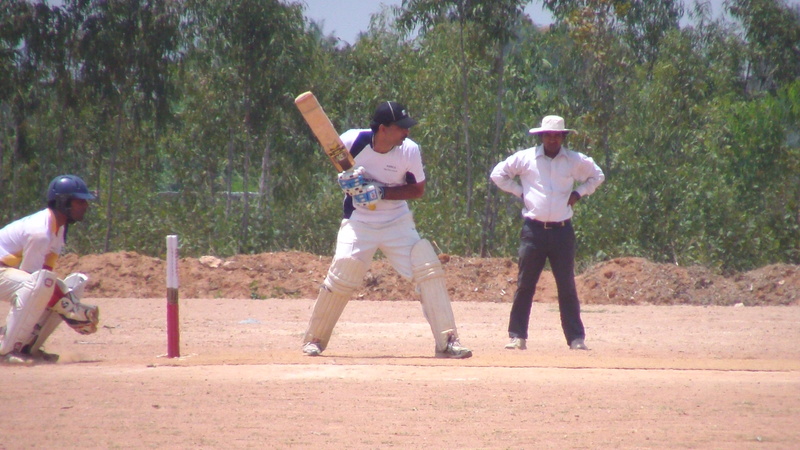 With the monsoons having set in, this probably is the best time of the year weather-wise to play cricket in Bangalore. As the tournament kicked-off under clear skies and balmy weather, Dheeraj won the toss and inserted AMD in. Captain Dheeraj was in his elements straight away keeping the AMD openers, Kathik and Viswajeet, honest with his accurate left-arm swingers. However, Abhishek was wayward bowling from the other end. Abhishek, with his tremendous sprint to the wicket generated good pace but was too short and too wide to cause any discomfort to the batsmen. The aggressive Viswajeet was severe with cuts and pulls. Karthik joined in the fun too as both seemed to be putting in a fine exhibition of putting away short deliveries. 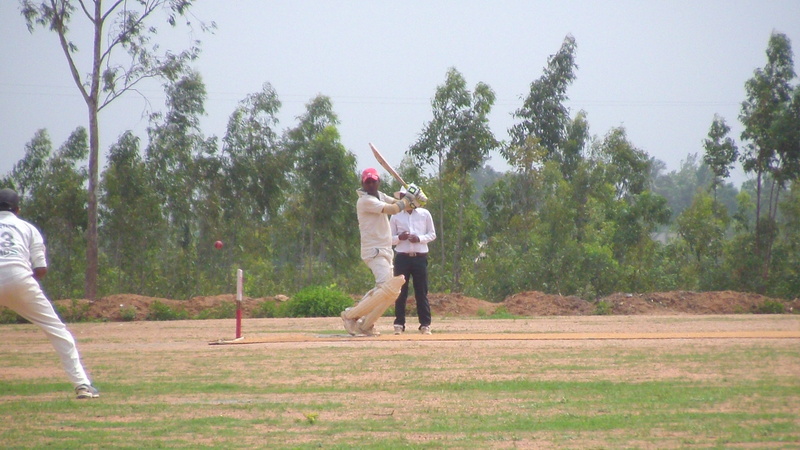 Dheeraj replaced Abhishek with Babu and he was immediately cut away for two boundaries in his first over. As the bowlers struggled to find lines and lengths, AMD brought up their 50 in the 8th over without breaking into a sweat. If anything the running between the wickets was the only unimpressive bit and eventually it was one poor call too many that accounted for the wonderful opening partnership. 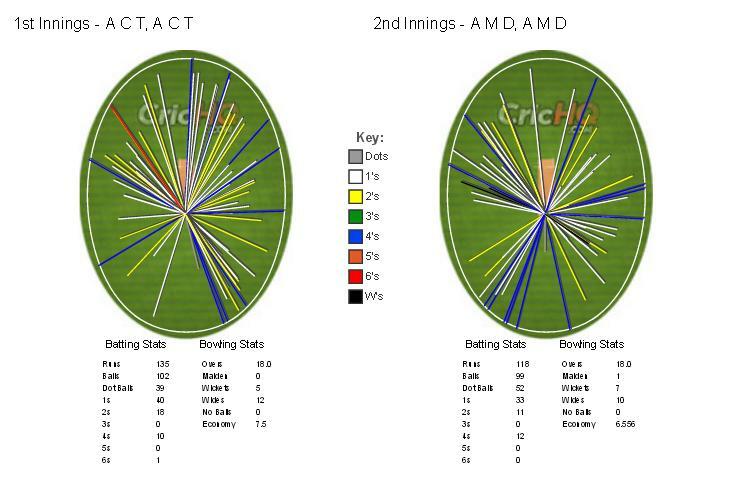 The spin twins Mallikarjun and Arvind put the brakes on AMD scoring as they controlled the next 9 overs giving away only 37 runs with only 2 boundaries coming in this period. The lanky offie, Arvind, varied his trajectory well while the leggie Mallikarjun troubled the batsmen with the pace he managed off the wicket. He often had the batsman playing from the crease and often beat them with his sliders, one of which cleaned up AMD’s captain Prashanth. Having managed to ride the rough waters, Vikas and Kiran were expected to launch in after the spinners gave way to the 6th and 7th bowlers of GE. However, Manish, coming in 6th change would have it all his way with his tidy medium-pace. He sliced through the under belly of AMD with the wickets of Vikas and Kiran in his first over and then accounted for Darshan in his second. AMD’s hopes were dented further when Arvind accounted for the big hitting Lohith. With almost 10 overs to go and already 7 down it looked unlikely that AMD would even bat out their allotted overs. They would eventually be bowled out for 143 in 26.1 overs. “We were going at a good rate through the innings even when we kept losing wickets. Perhaps not utilizing the full quota of overs hurt us in the end. We should have capitalized better on the start we got and should have got to a 180 kind of score at least,” said Prashanth at the end of the game. Chasing 144 in 30 overs, AMD had to make early inroads into the GE batting to put them under pressure to perhaps cause a panic. More so with Rajnikanth opening the innings. 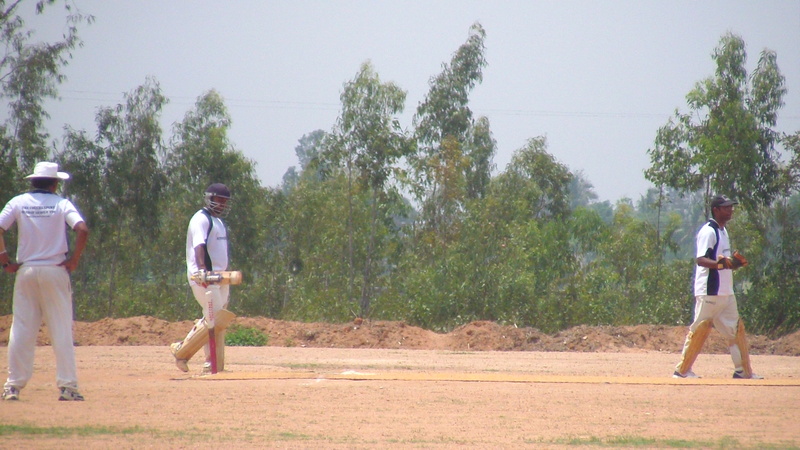 His last innings at this ground against Accenture in a practice game produced the only hundred at this ground insofar. Rajnikanth and Rajesh had shared a massive 150-plus opening stand two weeks ago at this ground. They seemed to be in no hurry and in no trouble as AMD bowlers struggles to keep them in check. Rajnikanth, a very powerful player who likes to hit the ball in the air got his stride in with three boundaries off Ravi in the second over. Soon, his trademark pulls, cuts and lofted straight drives scorched the CECG turf. His partner Raja did the smart thing by putting Rajnikanth back in strike as often as he could. Rajnikanth cuts en route to a 51-ball 67. Everything AMD threw at Rajnikanth was met with disdain. Cuts, back cuts, pulls and drives embellished his belligerent innings as the 50 was raised in the 7th over. Soon Rajnikanth brought up his 50 with a lofted 6 over long-off. He had broken open the game and when he was eventually dismissed in the 11th over, the score was 87 with less than 60 needed in almost 20 overs. 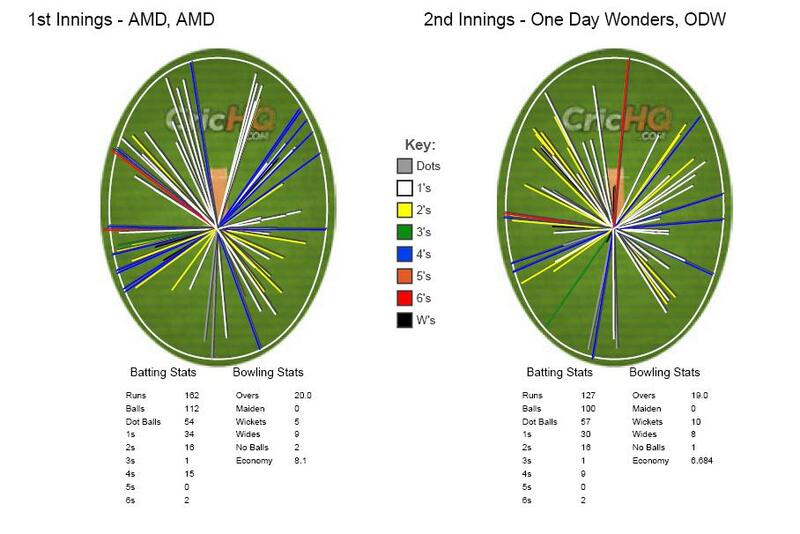 AMD fought back well with quick wickets but the game had drifted away too far for them to claw back. 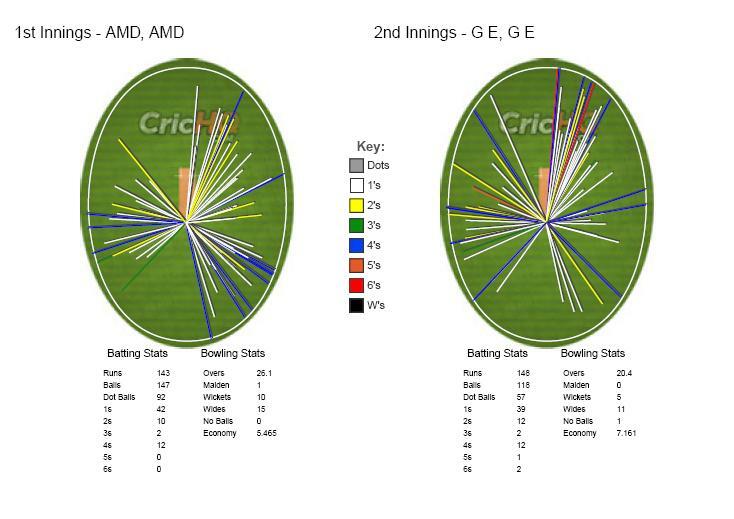 Eventually GE won the game in the 21st over with 5 wickets. “The spinners brought us back into the game after their top-order really looked good to take the game away,” said Dheeraj at the post-match ceremony. He also credited his openers for chasing the total down easily. “I feel very comfortable going after the bowling from the first ball. That is my natural game,” said Rajnikanth at the end of the game. He added, “It is like my home ground now.” With three fifties and a hundred in 6 games at this ground and with the promise of more to come, his team will feel good about their chances. Toss: AMD won the toss and elected to field. Consistency had been the bane for both these fine teams as they locked horns in the mid-day game of the last Sunday. 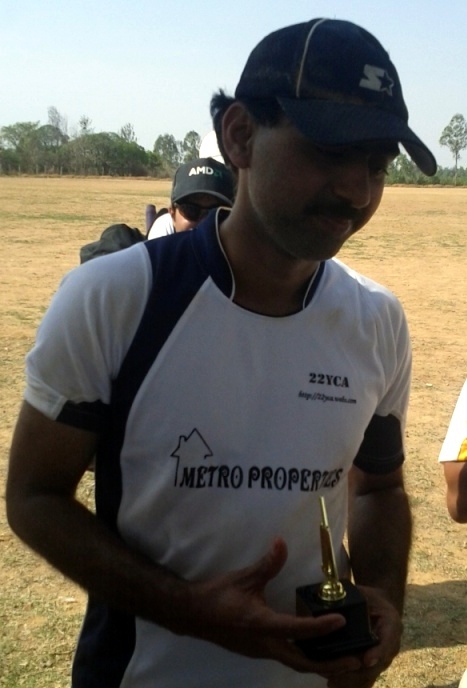 Having witnessed MCC struggle batting first, Prashanth opted to field first after winning the toss. Ajay and Vinay, opening for ACT hardly had any discomfort as Chethan bowled a poor first over with innumerable extras as 16 came off the first over. Ajay with a back foot punch to the cover boundary had already played the stroke of the day and with Vinay looking threatening as he has all though the tournament, trouble beckoned for AMD. ACT found the boundaries easily as 57 came off the first 6 overs. An assortment of bowlers – slow and fast – were tried to no avail. Finally Prashanth turned to Anil and he had Ajay bowled off his first ball. Vinay, though, went on his merry way at the other end tearing into AMD’s bowling. Much to AMD’s relief ACT were unable to keep up with Vinay at the other end as their bowlers managed to keep a check on one end. Deepak, Shankar, Thomas and Sharath all got out in an attempt to up the rate as Anil and Arun kept them in check. Vinay, now well past his 50 was in punishing mood and Paddy provided the finishing touches as AMD powered to 135 in their allotted 18 overs. For AMD, it was a case of pulling things back after a poor start during the powerplay. Viswajeet and Piyush started off brightly for AMD as the two short openers played handsome strokes against Paddy and Kalappa. The pair were particularly severe square on the off-side playing some very delightful square drives. Sharath quickly turned to spin as more than 45 came off the first six overs and Thomas struck immediately having Viswajeet caught. 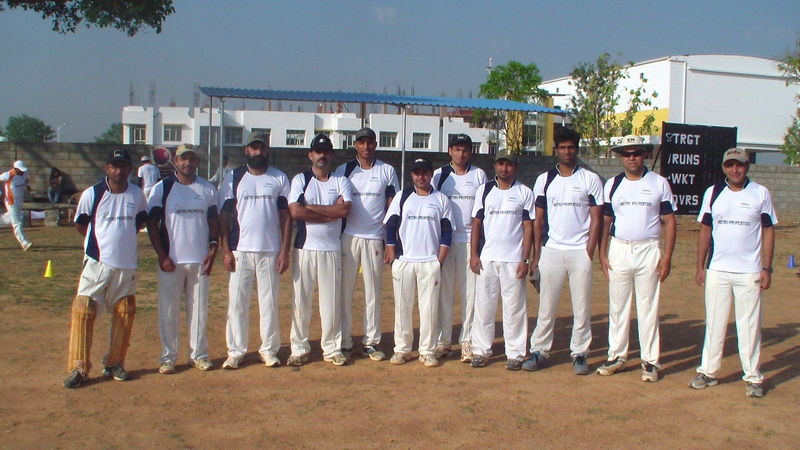 Vikast joined Piyush and the pair kept at the required rate with positive batting. And at half-way the game was evenly poised. The introduction of Rohit changed the equation quite dramatically. The wiry off-spinner has been a delightful performer tossing his off-breaks and inviting the batsmen to go after him. He puts enough revolutions on the ball to achieve a drop on the batsmen making them mishit often. Here too he had AMD groping after his flighted off-breaks. His cunning is in deceit with dip more than turn and it accounted for several AMD batsmen who looked to swipe at his loopy off-breaks. He accounted for the dangerous Vijas and then the captain off successive deliveries. And he came back to completely break the back of AMD in his next over as he scalped the big hitting Kiran and Amit. In a span of 10 deliveries he had sewn up the match for his team. In the end, it proved too difficult for AMD to recover from the blows of Rohit and they eventually folded up 15 runs short. Performer of the Match: Vinay. After another exciting Sunday where 4 of the 6 teams were in action, ACT and ODW have moved out of title contention where as the remaining 4 are very much with a chance. CITI notched up their 2nd successive win after a thrilling 1-wicket win in a last ball finish over ACT. Their negative run-rate means they need a big win and also need others to lose quite badly to be with a chance of finishing on top. 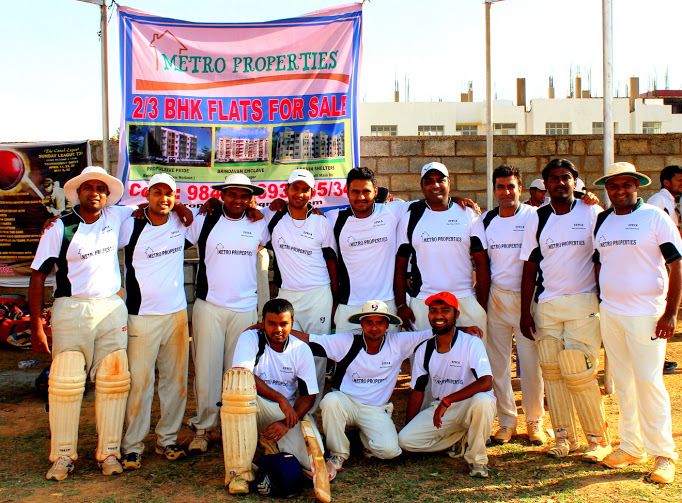 MCC’s comfortable 7-wicket win over ODW has put them 2 points clear of WIPRO and AMD, who have 1 game less than them. With 4 matches left in the competition, 4 teams can still finish on top. ODW and ACT can still ruin the dreams for those 4 teams. 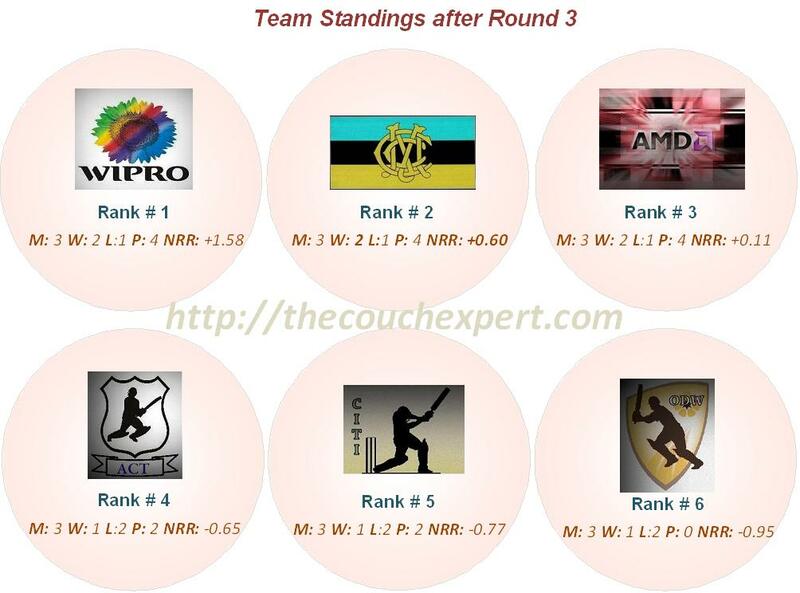 CITI upset the apple cart by toppling table toppers at end of Round 2 WIPRO to throw the tournament wide open. 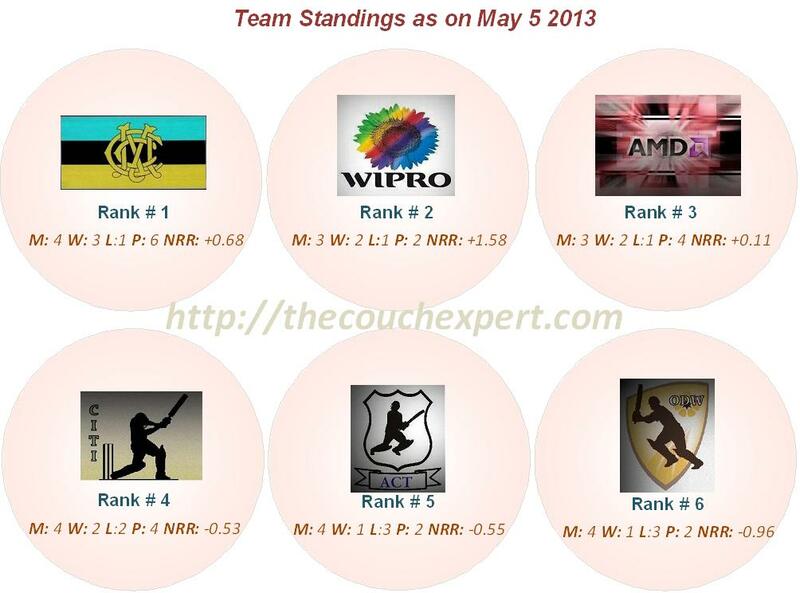 Victories for AMD and MCC has meant WIPRO, MCC and AMD are equal on points (4) with Wipro ahead on net run-rate. CITI’s win has lifted them off the bottom as they move to 5th position nudging ODW on better net run-rate. With only 2 points separating the six teams, theoretically all six teams are with a mathematical chance of winning the title should they win their remaining two games and results of other games go in their favour. As the tournament enters the penultimate Sunday of the competition, here is the points table after round 3. Toss: ODW won the toss and elected to field. With CITI toppling WIPRO in the earlier game, winner of this game was to join WIPRO on top of the table, equal on points. 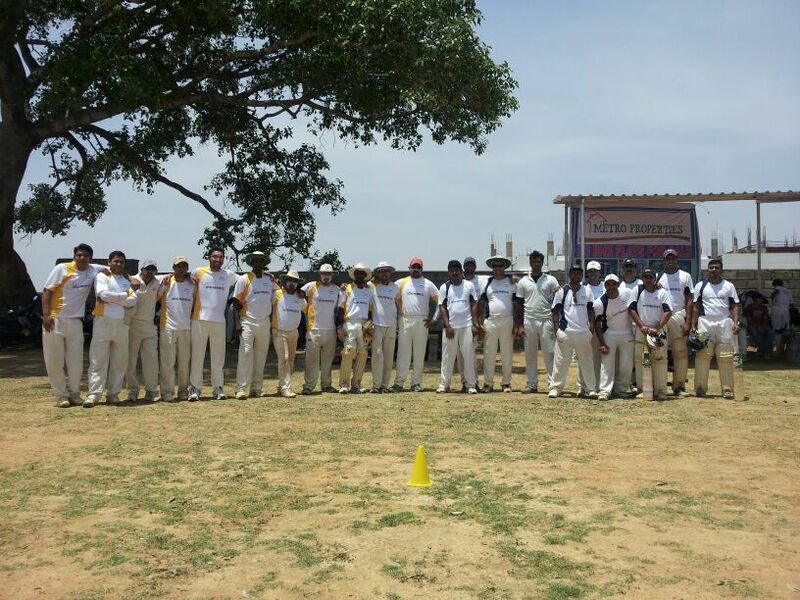 With the potential pole position on offer, there was much at stake as Swayam won the toss and ODW elected to field. Prashanth pushed himself down the order and sent Viswajeet to open with Karthik. It seemed to be a masterstroke as Viswajeet tore into the ODW bowling straight away. Vikas joined Viswajeet after Karthik fell early and the both seemed to be in hurry scoring at nearly 10 an over in the first 5 overs. Viswajeet got out after looking set for big innings. It brought captain Prashanth to the middle and he gave tremendous support to Vikas who looked in fine nick at the other end. Vikas was particularly strong square of the wicket on both sides and raced to 38 0ff 30 balls before he was undone by Ajit. By then 100 for the team was up in the 12th over. The scoring slowed down a bit as Rudra and Ajit bowled tidily. They were backed by Jyoti as the scoring was briefly reduced to a trickle, almost standstill. 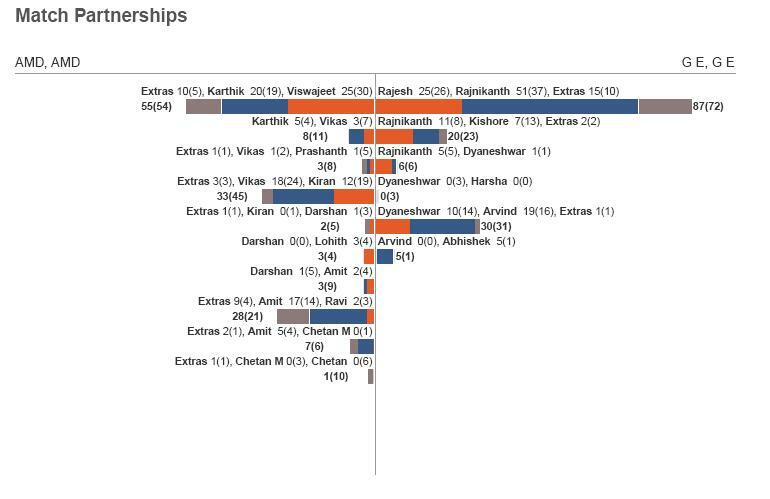 But Prashanth held firm even after losing Piyush and Kiran and set about pushing his team beyond 150 with the help of Lohith. The the law of averages soon caught up with Melvin as he was out second ball after two fabulous innings in the last two matches. Srikant though, coming on the back of two successive ducks, smashed three of his first four deliveries for boundaries. Rakesh was out as his powerful straight drive was gobbled up on his follow through by Kiran. Tej joined Srikant and the two were involved in a tremendous 3rd wicket partnership. The pair relied on boundary hitting and less on running between the wickets. Soon boundaries were common place. 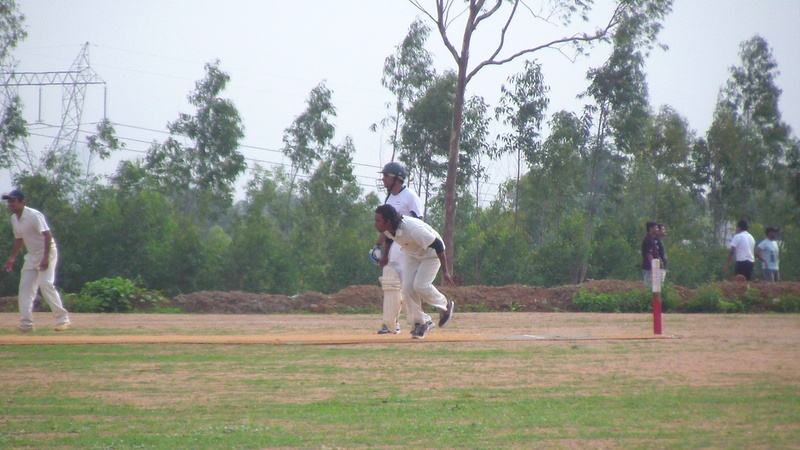 Tej and Srikant even helped themselves to a six each as they motored along at over 7 an over. The chase seemed well under control with the score nearing 100 in just over 12 overs. Srikant missed a short ball as he moved outside off-stump to pull it to square-leg. The ball hit is person and lobbed up and rolled back on to the stumps to give Prashanth and AMD a very welcome breakthrough. The 69-run 3rd wicket partnership had come in 59 deliveries and Srikant was out for 49. Jyoti came and went. As did Swayam and Kokan. In a spell of 9 balls, Lohith had broken the game open with a spell of 4 for 3. From then on there was no way back for ODW. “We are a team of medium pacers. I am the only spinner. My job is to keep the run-rate down and also to speed up the over rate,” said a delighted Prashanth at the end of the game. 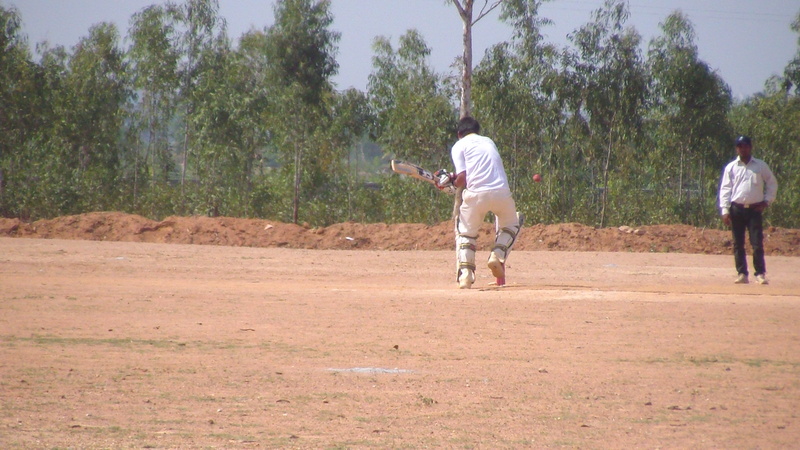 Lohith had come good with the ball after his match winning heroics with the bat in the last game. And with Viswajeeth and Vikas back among runs, AMD look good to fare well in their remaining two games as well. Performer of the Match: Prashanth.